We have moved. In a few seconds you will be taken to our new website. 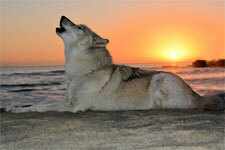 If it does not redirect in 5 seconds, please click Wolf Creek Ranch Organics here. Please remember to update your bookmarks. AMBER GLASS BOTTLES ~ These amber glass bottles are terrific for storing dried herbs, tinctures, colloidal silver, essiac tea, etc. You can make your own tinctures or store other natural health remedies safely and conveniently. All amber glass bottles are boston rounds and have black plastic phenolic lids, unless otherwise noted. The 8 ounce amber glass mister is fabulous and delivers a very light, quiet, and delicate mist. Excellent for misting the face or for animals, children, or plants who are shy of sprayers. 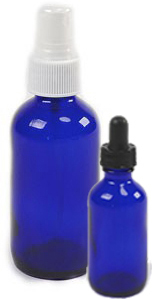 The tiny 1/2 ounce dropper bottles are PERFECT for splitting or sharing any of the 1 oz. Amber Tech Nutraceuticals for Pets tinctures. To order Amber Glass Bottles please visit our new site: Wolf Creek Ranch Organics. These are great to store essential oils, colloidal silver and your herbal tinctures. We have a limited supply of these bottles. 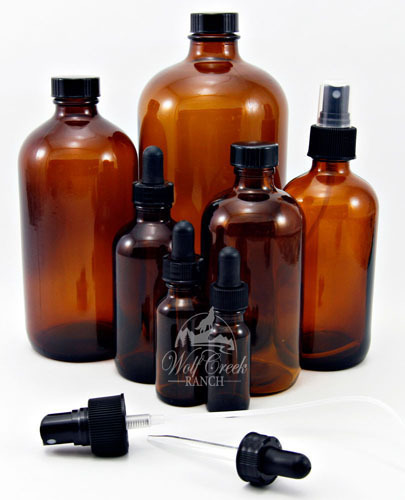 To order or Amber Glass Bottles or Cobalt Blue Bottles please visit our new site: Wolf Creek Ranch Organics.